The Knowledge Capture® Qi reporting module, enables business to visualise data via real time, drillable dashboard reports. These reports can take large quantities of data and provide it back to the business in a platform that can be show real insights to data and enable the business to look at trends on a granular level. The Knowledge Capture Qi reporting module is fully integrated with the Knowledge Capture Case Management solution. As data is entered into a case, whether it be a complaint, claim or counterfeit case, this data can be visualised to understand the progression of the case. SLA's can be managed in order to track progress of cases throughout the system and this data can be drilled down to an individual case worker view. These reports can be presented to the business as high level reports with basic stats or as granular as required based on every piece of data being captured by the business. If data contains geographical data when it's passed through the business, this information can also be visualised on a drillable map. The enables organisations to understand where in the world information is being generated, and provide details stats based on regions. 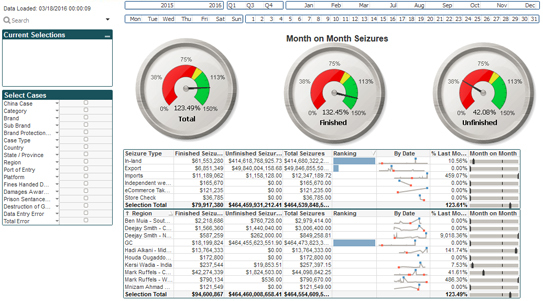 The data that is visualed via the KC Qi reporting module can be displayed in multiple different ways. A few examples of how its currently being used by customers includes geographical as shown above, by date, categorites, SLA's, by users, value or as a raw data format. All of the above can also be combined to create deeper visualisations. To discover how the KC social media module can help your organisation cost effectively bring control and efficiency to social media data, contact us today for a free demonstration.